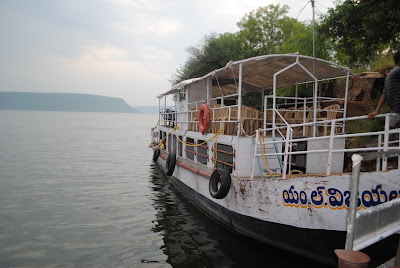 Nagarjuna Sagar Dam is the world's largest masonry dam built across Krishna River in Nagarjuna Sagar,Nalgonda District of Andhra Pradesh, India. 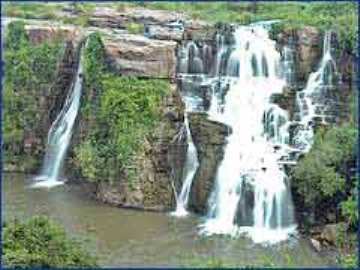 It is downstream to the Nagarjuna Sagar reservoir with a capacity of up to 11,472 million cubic metres which is the world's largest man-made lake. Once in a while it’s fun to play tourist and go sightseeing. So there we were last Saturday, eight of us from work, starting out at the ungodly hour of nine in the morning. The dam is approx 160 kms from Hyderabad, about a three hour drive, but what with the stopping for breakfast, the photo sessions along the way, and the getting lost (only one person knew the way) we reached the place at around 2 PM, just in time to get on to the last launch. Before reaching the launch station, we stopped at the bridge which was built across the river and is the main thoroughfare. The dam was amazing. They had opened only half of the 26 gates but it was still a breathtaking view. There you have this big structure, and water was flowing from the gates, crashing into the river below and you could see the white foam rising, forming a spray of white cloud at the base. And if you turned around you could see the river stretching as far as the eye could see, a beautiful sight. It was a humid cloudy day and I wished for blue skies so the river would look more beautiful. We took the launch, which was a big old boat, and off we went cruising on the Krishna River. It was a slow ride and we went crazy taking photographs and videos. It was a very calm day, and since we were moving at a very slow speed you could barely see the ripples on the surface. There we were, in the middle of the river, and all around us was the sky and water and jungles. It was very quiet and peaceful and made you marvel at the wonder of creation. I remembered a poem about the poet wishing to go down to the sea, and I think I knew how he felt. Being surrounded by all that calm, with no worries and no cares in life and where time doesn’t matter, what more could a man want? 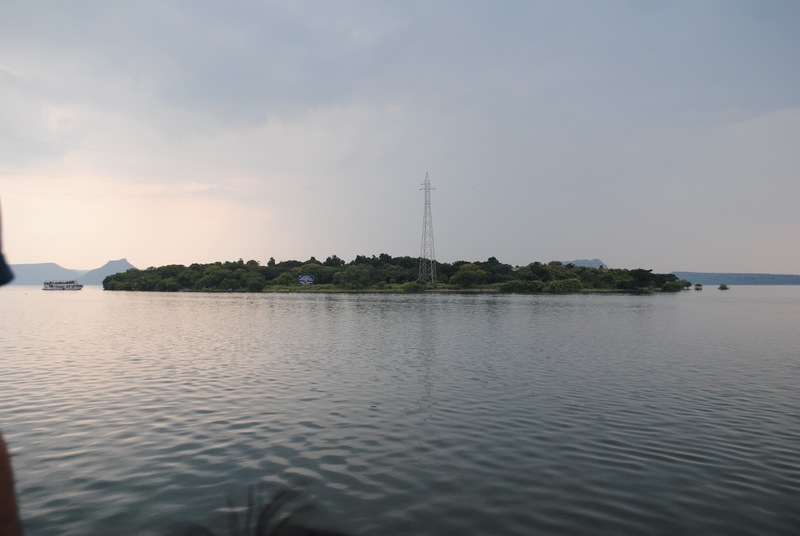 The launch took us to a small island called Nagarjunakonda where you could find a Buddhist museum. But we didn’t visit the museum because time ran out on us. After lunching on the island it was time for the last launch to leave and we hastily packed our stuff and went back to the mainland. The sun was setting as we sailed towards the launch station, but I was too tired I fell asleep and didn’t take the sun-setting-over-the-river photos. It was almost dark by then, and we had one last stop to make. Ethipothala Waterfalls which is about 11 kms from the dam. By the time we reached the falls it was completely dark and so we just viewed the illuminated falls from the viewpoint above it. Then we finally headed for home, a long and exhausting drive after roaming about for the whole day and sleeping for just a few hours the previous night. It is Navratri, so we stopped at a temple on the way and our Hindu friends went inside for prayers. It was eleven when I reached home. 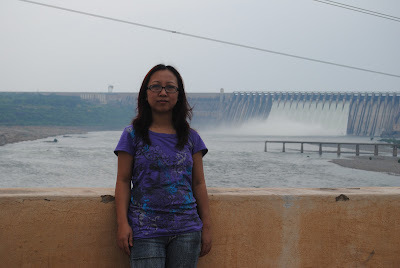 There are guest houses and motels near the dam, and my friends tell me the river is beautiful in the morning, and I'm sure watching the sun rise over the river would be a memorable experience. My favorite dam song is "Dam would break" by Toad The Wet Sprocket. Truly amazing song. Till today, the song rhythm rings in my head every now and then. Kim - Nagarjuna is a famous Telugu actor. But this dam was built in 1955, waaaay before he existed. aven - A lum ve pangngai, vawt zawk zawk chu a ni lo. Catherine - Caught me, didn't you? Yeah there are some horror movies that I've watched even though I knew I would get scared later; I just couldn't tear myself away. Seems you had a nice outing, but trust you to fall asleep right when you could get a good pic!! Its a shame there are no getaway places from Aizawl.Envy you. Yes daniel, it was fun, and exhausting. The sunset was really beautiful, but all I could think of was going home. The dam is a 3 hour drive from the city, and I'm sure there are places near Aizawl where you can go and get in touch with nature. Last time when I was home we went to Reiek Tlang, I really enjoyed it and would like to see more places. Aduh, you are so lucky to have gone for sight seeing with your colleagues! Trips like this brings us closer to each other which of course improves the quality of work environment! HV - Thanks for dropping in and thanks for reading the post. Do keep on coming back. Maisek - Yes, it is at times like these that you see who a person really is. You see people without all the makeup and pretense that they wear at the workplace, and definitely helps improve the friendship. Thanks for visiting and I hope this won't be your last. We've been planning to do this little trip forever but keep putting it off! I'll have tons of questions next time I see you, I really want to do it now! Jerusha, it's a trip you should definitely make. I would suggest you hire a car and a driver, because it's a long drive and can get pretty tiring if you drive yourself. And start early in the morning. Better still, spend the night at the guest house and set out before sunrise the next day.